The following article is not meant for people under 18 years old for most European countries and 21 years old for USA and 25 years old for Sweden and certain other countries with the same age regulation for digital content about beverages containing alcohol. Therefore, if you aren’t above the legal drinking age in your country, please leave this article. Scheiblhofer is well-known for its full-bodied fine wines with lots of personality. The winery is located in the beautiful region of Burgenland and Lake Neusiedl, which was declared a Unesco World Heritage site in 2001. Burgenland is a famous wine-growing region in the eastern Austria with good conditions for wine cultivation. This lowland has a relatively dry climate with hot summers and not too cold winters. Also, the soil is rather mineral and gravelly. In addition, the immediate proximity to Lake Neusiedl has a positive effect on the growth of the Zweigelt, Merlot, Shiraz and Cabernet Sauvignon and other grape varieties. Andreasberg is not only an exhibition vineyard with over 60 different grape varieties, but also OFFICIALLY CLASSIFIED AS A MOUNTAIN VINEYARD. Created by Scheiblhofer, Andreasberg is the highest point of Andau. It provides an amazing vineyard experience. During my visit there, I absolutely loved it, as I could enjoy a charming picnic among the vines and a splendid view from the looking tower. Scheiblhofer is one of the largest wineries in Burgenland because the winery owns over 75 hectares of vineyards. The company was found by Johann Scheiblhofer, and currently leaded by his son, Erich Scheiblhofer. The young winemaker Erich Scheiblhofer collected his wine-knowledge in California and Australia. As a result, he became a winemaker and international oenologist. He, without doubt, managed harmoniously incorporate family traditions and new technologies. Consequently, creating sensational full-bodied, strong wines. Scheiblhofer is always at the front row of winemaking, integrating up-to-date technologies. For example, they use a new generation of Diam corks. Through an exclusive patented process, cork “de-aromatization”, these cork-closures ensure incomparable sensorial neutrality. Hence, securing the perfectly controlled ageing of wines. In 2011, Markus del Monego (Best Sommelier of the World 1998) and Adreas Larsson (Best Sommelier of the World 2007) gave 94,5 points to Scheiblhofer Cuvée Rot – Big John. That was the highest number of points out of all 300 tasted wines. Within number of years, the winery has been receiving the title “Winery of the year” as well as many other awards. Being winemakers, the team cares a big deal about nature. From energy self-sufficient and environmental responsible wine production to e-bikes and e-cars, they surely show a strong statement for sustainability. The winery has been awarded with the sustainability certificate by the Austrian Winegrowing Association since 2017. In Switzerland, you may find this exquisite wine at all Mövenpick wine cellars and/or online store. Wine Style: Dark ruby ​​red, very mineral on the palate, with the notes of blackberry and cherry fruits, perfect structured tannins and great balance. Manufacturing: 18 months in oak barrels. Maturity: from now and until 2025. Wine Style: Structured white wine, with intense bouquet of freshly roasted hazelnut, citrus fruits, vanilla and caramel notes. Manufacturing: 8 months in oak barrels. You also have an opportunity to discover more of Scheiblhofer wines during the Mövenpick Weinmesse 2018. It is taking place on October 26th in Lucerne, and on October 27-28 in Zurich. Stay tuned for more details about the Mövenpick wine fair on World of Julia. 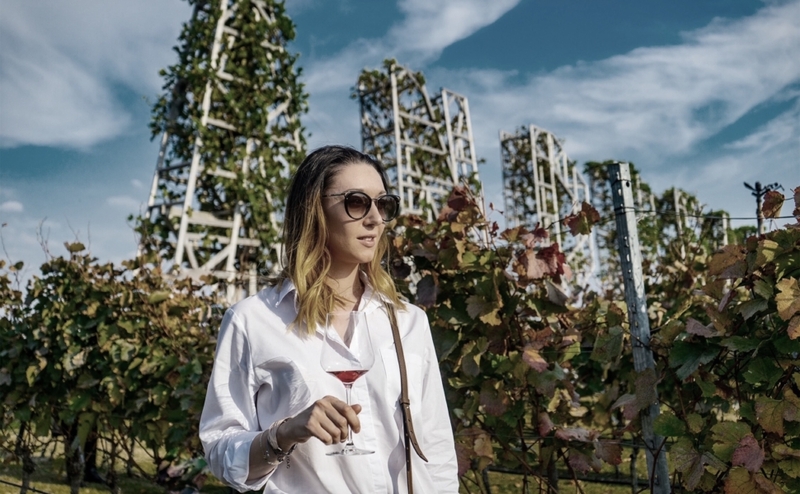 If you are a wine enthusiast and happened to be in the Burgenland region, you would certainly enjoy discovering bold Austrian wines at the Scheiblhofer winery. Firstly, it is open for a wine-tasting experience daily from 8 am to 6 pm. Beside that, you can learn about the wine production and cultivation during a guided tour. And even more, there is a charming guest house and a newly build event hall. In a word, everything you need to create an unforgettable wine immersing experience. You may also find more information about Scheiblhofer winery on its official website.